Welcome to Studio 8, we are a cooperative pottery based in south Staffordshire. We love nothing more than making shedloads of functional pots. Everything we make comes from the wheel and is fired in our two chamber wood fired kiln. Mostly, we sell through specialist gardening events and local farmers markets (See Upcoming Events). By selling direct to our customers we are able to not only lower our carbon impact, but also keep our ware affordable. We don't have a gallery shop onsite, but visits to the workshops are normally welcome. However please get in contact with us first to check that someone will be around to show you around and offer you a cup of tea. 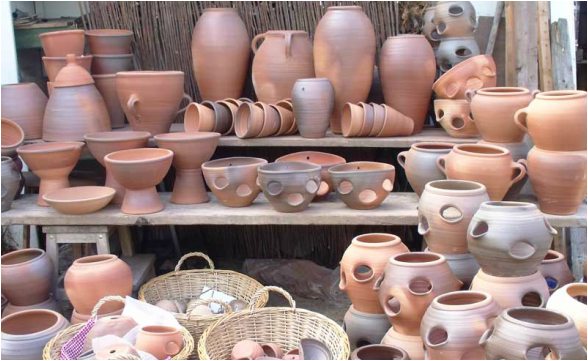 If you require any further information about our pots, when we will next be selling or even if you want to pick our brains, feel free to contact us via the Contact Us page.